If you just started (or wish to start) with pogo jumping, you have come to the right place. Here you will find all the necessary information, tips and advice you’ll need to choose the right equipment, learn the basics and even proceed to more difficult moves and tricks. So let’s start! 1. 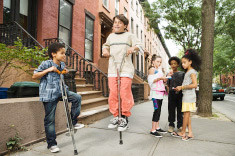 What is a Pogo Stick – if you have only a vague idea what a pogo stick is and what it’s capable of, read this short section first – otherwise feel free to skip it of course. 2. Choose the best stick for your needs – there are many different sticks on the market today but which one is the most suitable for you? View our most recommended models for kids, teenagers, adults or tricks! 3. Learn how to ride it – learning how to bounce is not difficult – but our guide (with videos as well) will make it even easier. 4. Start with pogo tricks – and after you master the basic jumping, you would probably want to learn some cool stunts – so we’ll start with the easier ones and continue to the more difficult as your skill increases.